I will admit it. My laundry room was a disaster. 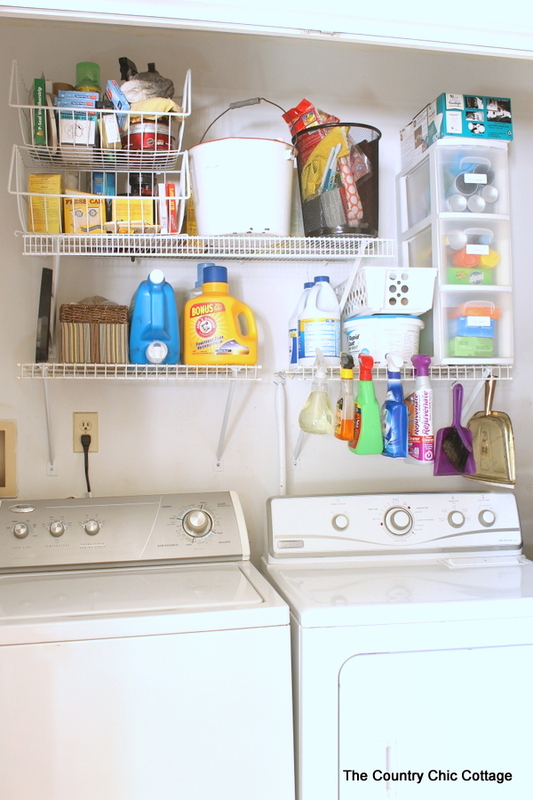 We have been decluttering around here and the laundry room was on the hit list. 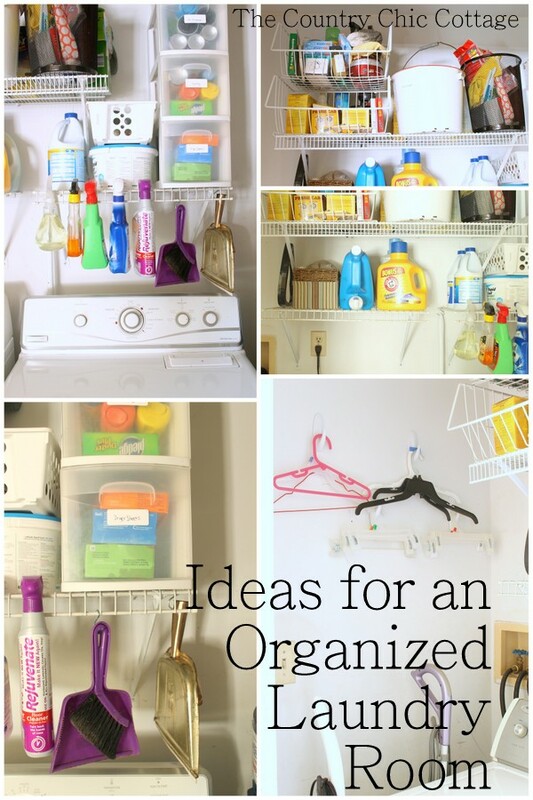 We came up with some great ideas for an organized laundry room and I thought I would share them here. This post is sponsored by Online Labels however all projects and opinions are my own. Lets start with the dilemma of such a small place. This is really a laundry CLOSET. There is just enough space basically for the washer and dryer. I didn’t have a place to hang clothes to dry. You know those delicate items and other things that just can’t go in the dryer. I have been using those shelves to hang clothes from but they are just in the way there. So after MUCH brainstorming and back and forth the answer came in the form of Command Hooks from 3M. They are perfect in that I did not have to put any holes in my wall. I was afraid with all of the plumbing in this area of my home that a nail hole would end up with a flooded home. The Command Hooks are working out perfectly so far! I have a variety of hangers on them for everyday so I can pick the best one for the clothes that need to dry. Next lets move onto those shelves. They are just standard wire closet shelves that were here when we moved into this home. So y’all don’t criticize the placement. I worked with what I had in this situation. A collection of baskets, buckets, and more made the shelves more useful however. I used some wire baskets on that top shelf for storage of smaller items. 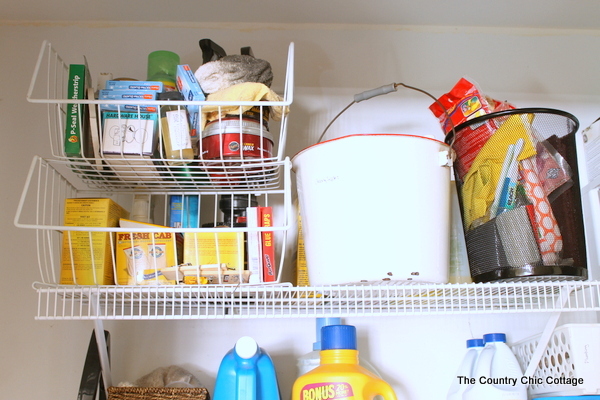 The white bucket and waste basket also help to corral some of the like items into containers. My favorite addition is a long skinny set of plastic drawers. They are perfect for dryer sheets, extra cleaning supplies, and so much more. I used the OL875 labels from Online Labels in a Weatherproof Matte for labeling everything in the laundry room. The weatherproof labels hold up under any condition. I use them in areas where the labels might get damp or in the freezer to label food. 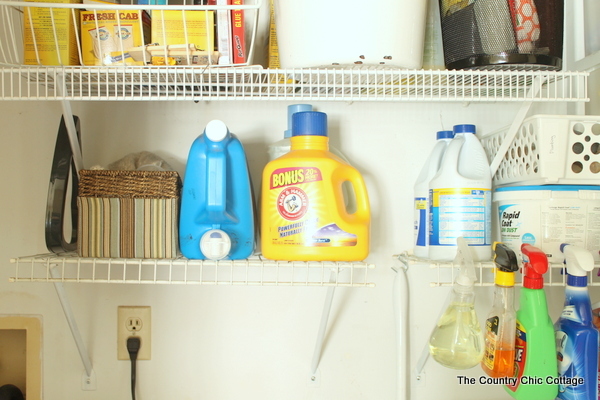 I used the shelves as hanging storage for those cleaning supplies I do not use often. Plus some hanging storage with a few S-hooks for my dust pans. 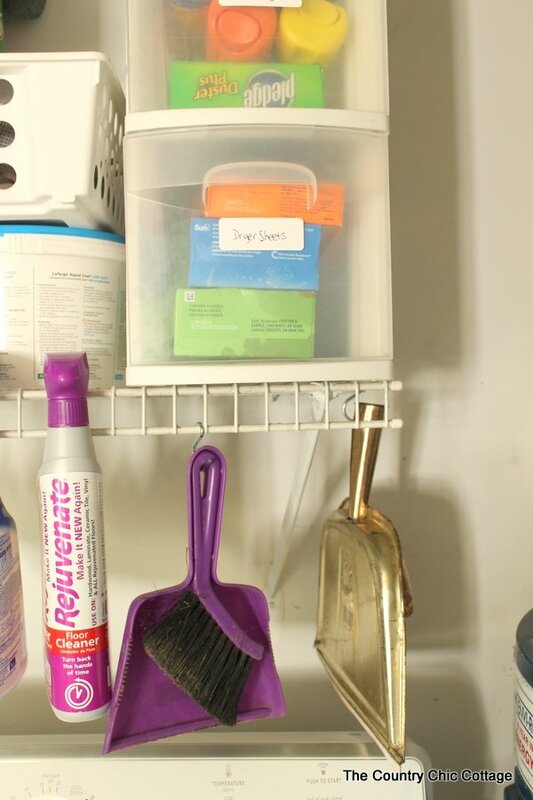 You can see how I store my everyday cleaning supplies by clicking here. My favorite part of this entire space? The fact that the top of the dryer has NOTHING ON IT!! Okay usually I store the empty laundry baskets on it but it was piled high with junk, cleaning supplies, and more. It feels so good to have this space cleaned up, organized, and ready for some laundry. 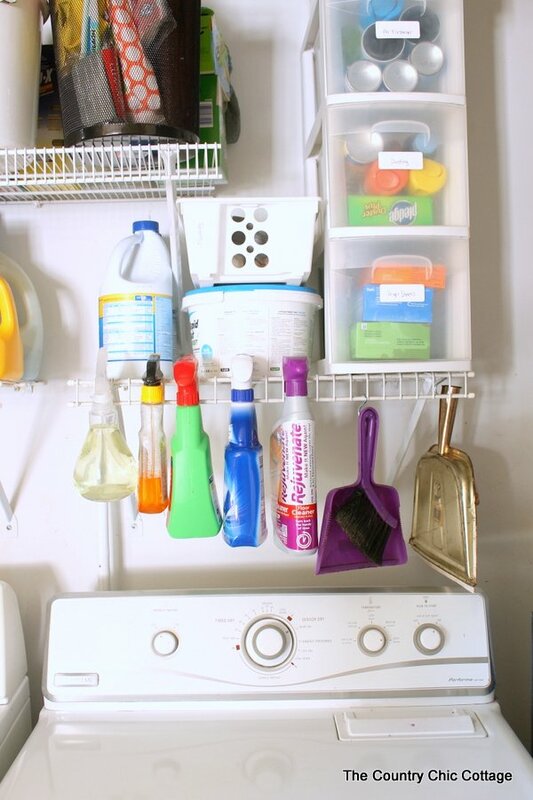 Do you have any other ideas for an organized laundry room? Leave them in the comments! 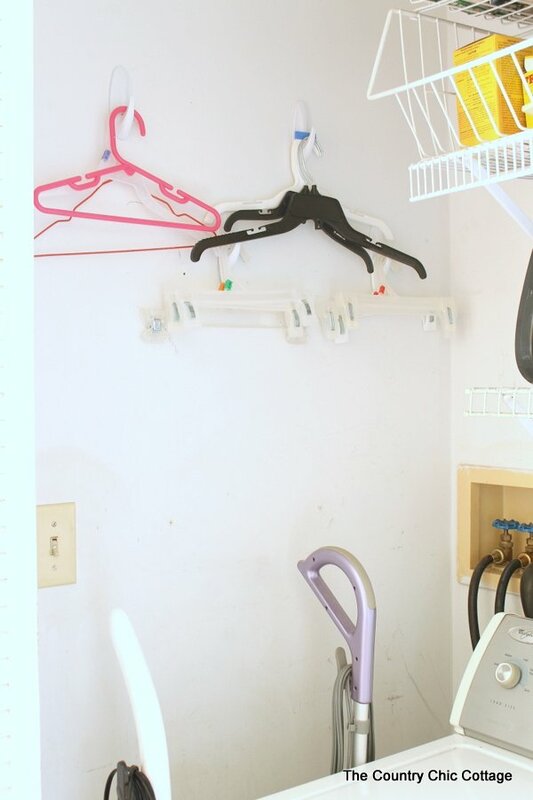 Want to see another organized closet space in my home? 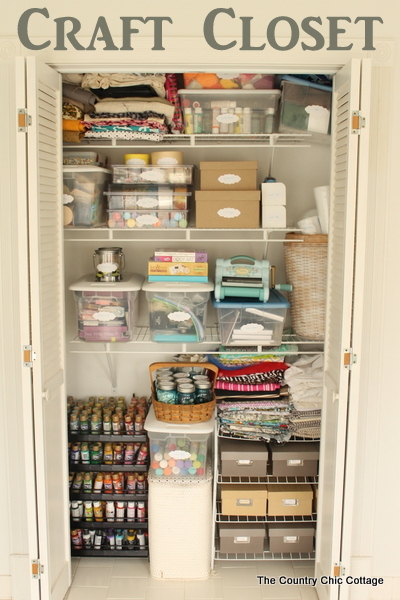 Click here to see my craft closet. I love how your ideas are practical!